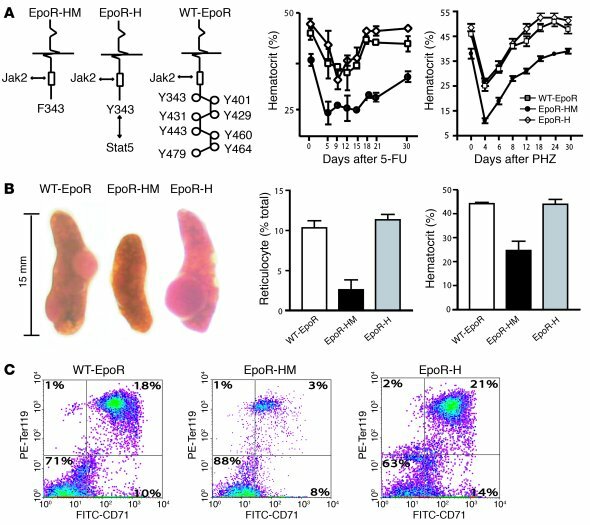 Efficient stress erythropoiesis in response to 5-fluorouracil, hemolytic anemia, or bone marrow transplantation is not supported by a minimal PY-null EpoR-HM allele but is rescued by EpoR-H–PY343–Stat5 signals. (A) Mice expressing the diagrammed EpoR alleles (n = 8 mice per allele) were treated with 5-fluorouracil (5-FU) or phenylhydrazine (PHZ). Induced anemia and recovery were then monitored over a 30-day time course based on hematocrits. Note the sustained anemia incurred in EpoR-HM mice in each model. Hematocrits are means ± SEM for 4 mice per time point. (B) In transplantation experiments, marrow preparations from WT-EpoR, EpoR-HM, and EpoR-H mice were transplanted into lethally irradiated Ly5.1-marked recipients. For mice with at least 95% Ly5.2 donor cell contributions, day 15 reticulocyte levels and hematocrits were determined and representative spleens were photographed. (C) Frequencies of CD71highTer119+ erythroblasts in recipient spleens also were analyzed.